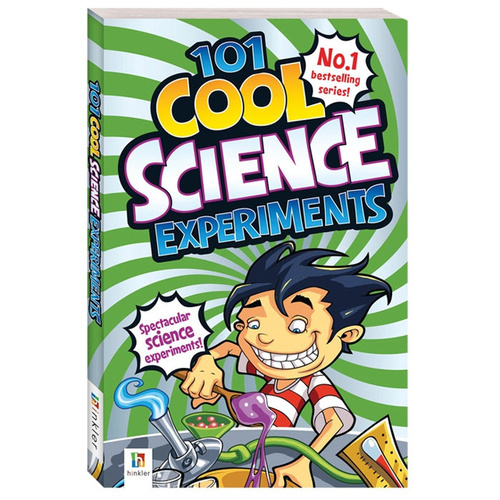 101 Cool Science Experiments | 101 of the coolest experimens here for any budding genius! Want to see an egg bounce? How about grossing out your friends with home-made boogers? This spectacular book will show you how, it's full of simple science experiments to shock and amaze you! Everyday materials such as vinegar, string, eggs and paper are used to create extraordinary things. They will help you find out how science works, and why things happen the way they do. Most of all, these experiments are fun! You'll end up growing your own stalactites and creating invisible ink. Why not make a mobile out of gelatin or dive a mini submarine into the depths of a bottle?! Your kitchen won't be the same when you create your own volcano, and if you like to eat, why not try baked ice cream! You'll find most of the equipment you need for the experiments around the house. A good tip is to find an empty box and keep it stocked with things you might need. Don't throw out used jars, corks or lengths of string, store them in your box all ready for your next experiment! Each experiment has a rating of easy, medium, difficult or adult required. There are 101 of the coolest experiments here for any budding genius! Suitable for children ages 7 and up. 207 pages of experiments and easy to follow illustrations with facts.